I have a confession. There are a lot of whole wheat recipes out there that I don’t like. I think many of them are tasteless, heavy, or gritty. I am not very happy when I spend the afternoon baking only to have my family refuse to eat it. It makes me so mad. With that being said I think that wheat is a great food storage item. It is inexpensive, readily available, easy to store, and has a very long shelf life. A little while ago I was at my Mom’s house and my sister in law Ashley brought over a loaf of bread. She asked if anyone wanted some. Well we all like to eat something someone else made, so we sliced it up and tried it. It was really good. I asked her where it came from and she told me that her friend, Sueann Allen, had given it to her. Ashley went on to tell me Sueann’s story. Her young children had some health problems and the doctor had prescribed a high fiber diet. Sueann researched her options and decided that a whole wheat diet was best for her family. So she started cooking with whole wheat. She converted all of her families favorite recipes to whole wheat. After hearing about Sueanne’s story and eating her delicious bread, I bought her cookbook. Sueanne has compiled all of family’s favorite recipes into a cookbook. Suzie’s Sweet Wheat. I also made Out of This World Moist and Gooey Cinnamon Rolls. I could tell that they were made with whole wheat but they were very good. Good enough that I took some to the neighbors. The recipe work and are not fussy. The book covers pretty much anything you could ever want to make out of wheat. There are a lot of recipes for baked goods but it also includes recipes for homemade pasta, pita bread, salads, and smoothies (she adds wheat berry puree). The recipes give clear instructions and rely on standard measurements. 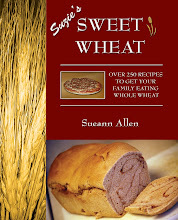 This book converts a lot of family favorite recipes to include 100% whole wheat. No photos. I always want photos with every recipe. I know I’m a visual learner. But black and white photos would have been great. There is a font problem. In a past life I was a graphic designer (I was not very good) but I did develop this thing about fonts. All of the recipe titles in this book are screwed up. They are readable and fine. But it bugs me. The bread recipes in this book make large batches. That is not necessarily a bad thing but as a girl who doesn’t own a Bosch 9-12 cups of flour is way more than my little Kitchen Aid can handle. It would have been nice to have a small batch recipe. For those of us living with Kitchen Aids. Overall recommendation: I really like this cookbook. It has encouraged me to bake with more whole wheat then I was. This is a must have for any one that is storing a lot of wheat.